an after market CDI ignition system? Capacitor discharge Ignition (CDI) systems or Capacitive Discharge Ignition (CDI) systems store, or accumulate voltage, until a point at which a signal allows release discharge of the stored voltage to the spark plug. An aftermarket CDI ignition system greatly increases the voltage available to the spark plug allowing for a longer, more intense spark. Engine modifications such as high compression domes or large bore kits further stress an ignition systems ability to provide ample spark energy. Although it may sound strange, the air we breathe has electrical resistance that the ignition system must over come in order to ionize or spark across a plug. As pressure increases, the air becomes denser and provides even more resistance. Try a little experiment to prove air resistance, blow up a beach ball sitting at sea level then toss on your scuba gear and repeat this same feat at depth of 100 feet. OK, so my example may be a little wet but the pressures involved are comparable to the dense air/fuel mixtures your ignition system is fighting to ignite. High performance, freestyle and racing personal watercraft applications will often remove the heavy factory charging flywheel electing instead to install a light weight, non charging aftermarket flywheel and a Total Loss Ignition System. The principal advantage of the Total Loss Ignition is the ability to remove rotating mass from the engine allowing it to rev quicker and free up horsepower that would otherwise be required to spin the charging flywheel. Since the total loss ignition is totally dependent on the battery for power (without the ability to be recharged) selecting a good high AMP hour PWC battery is a must. 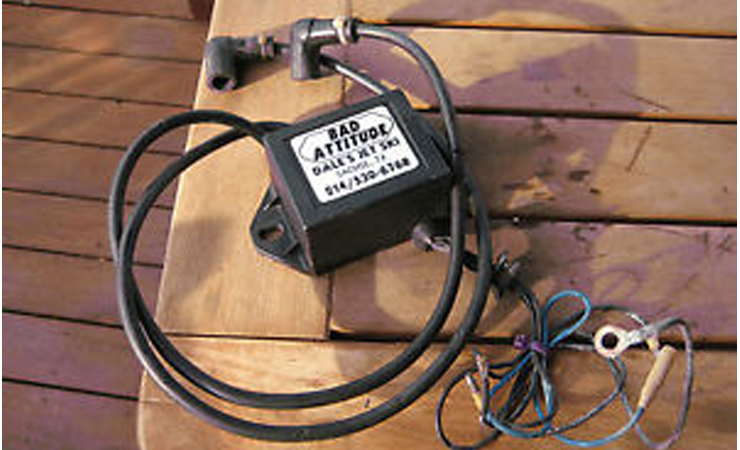 We decided to design and manufacture our own line of Bad Attitude Ignition systems after extensive research and testing of currently available high energy CDI systems. While in most cases we found their performance adequate, none provided the electrifying performance our customers have come to expect from our shop. Our exclusive Bad Attitude Ignition systems provide reliable, intense spark energy even under the extreme cylinder pressures experienced in racing engines.